Taste test: These potato chips were thin cut and very crisp, with a mild but tasty onion flavor. Not really a sweet onion, more of a sharp onion. There was probably some cheese flavor mixed in as well, but mainly I noticed the onion. 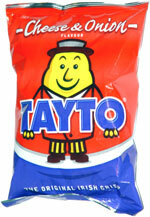 This bag was small, but that didn't stop Tayto from a packing a whole lot of chips into it.